KOKOMO, Ind. 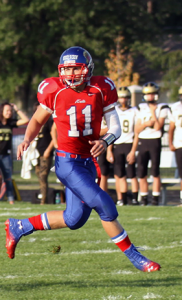 – The Kokomo High School athletic program took a devastating hit when star football and basketball player Tayler Persons suffered a torn ACL, an injury that will keep him off the football field for the rest of the season. The injury occurred on a run during the second half of the Fort Wayne Wayne game in week two of the season. And according to Persons, he knew right away something was not right. When Persons didn’t get up from the hit near the sideline, many on the Kokomo side of the Wayne press box cringed. We all know how tough of a competitor he is, and while he may be slow to get up after some plays – he always gets up. But not this time. The Wildkat training staff helped him limp to the sideline and most of us had a sinking suspicion that this was a serious injury. Persons was the heart and soul of the Kats, but even injured, he knows he has a role. He said that while he is not going to be on the field, the Kats team captain can still play a vital role with his leadership and experience. But just how important can one person be to an athletic program? Persons was the starting quarterback and free safety for the Wildkats. He played in 33 games during his four seasons, rushing for 694 yards and 14 touchdowns. He also passed for another 847 yards and 11 scores. But while he steadily led the double wing offense, it was on defense that he was an absolute monster. He tallied 245 tackles – fourth most in school history and well on pace to break Curt Hutchins record of 299. He also had 114 assisted tackles (second all-time) and five interceptions and was also a member of the 2010 and 2011 North Central Conference champions. On the basketball floor, Persons was a contender for the title of Indiana Mr. Basketball and has already committed to play at Northern Kentucky University – a school he says is 100 percent behind him during this injury. He has 913 career points and was on pace to finish third in school history behind Wildkat legends Goose Ligon and Jimmy Rayl. In three seasons, he helped lead Kokomo to a 65-11 record, including a 22-3 record and the NCC title last year. He was also a key member of the 2011 IHSAA Class 4A state runners-up squad and was a 2013 Indiana Junior All-Star performer. Yes, he was that important. He was the difference between Kokomo winning and losing against Muncie Central last Friday night. And his loss will be the difference in many more games during the rest of the 2013-2014 athletic season. Many Kokomo fans have asked if this is the last we will see of the crowd favorite. Knowing the work ethic of Tayler Persons, he might just show up on the court at Memorial Gymnasium come late February 2014 – and I for one would love to see him play once again. Until then, this is a prime opportunity for Wildkat athletes to step up and fill the void left by Persons. Much like Luis Ascencio did Friday night when he rushed for 56 yards and a touchdown. Who is Luis Ascencio? I have no idea – I have to admit I had never heard of the 5-6, 165 pound sophomore and had to look him up in the program. But I will inquire about him this week – and I bet there will be more Kats who dig deep and pick up the slack of their downed leader.